Happy Robbie Burns Night 2019. The famous Scottish poet Robert Burns ponders a head louse in the hair of an attractive well-to-do young woman in church. This remind us that head lice have been with us for centuries. In fact some people call nitpicking the second oldest profession! Furthermore Burns elaborates on how he wishes he had a toxic powder of some kind to kill the louse. In addition Burns expresses shock that a woman of means could be afflicted with lice. Happy Robbie Burns Night 2019! 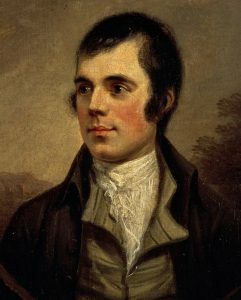 Today is the Birthday of famous Scottish Poet Robert Burns whose 1786 poem “To a Louse” remains burned into our memories! Especially relevant is the text of the poem that details Burns observing a head louse crawling on the hair of a lady in church. In fact Burns indicates his disgust for the louse, wishing it away. Ha! Where are you going, you crawling wonder? But Miss’s fine balloon bonnet! fye! How dare you do it. And set your beauties all abroad! ← NitWits Belmont. Your Peace of Mind is Worth it!